The ProfiClear Premium Moving Bed Module is a biological pond filter, generally used after the automated Drum Filter Module (pump and gravity fed versions) and contains a mass of specially designed Hel-X biomedia which acts as housing for beneficial micro organisms. The Hel-X media contains a very large surface area (40% greater protected surface area than Kaldness K1 Media). The Moving Bed Module features an Aerator Bar at the base of the module which can be connected to an optional Air Pump for optimal movement and oxygenation of the Hel-X media. Directly connects after the Drum Filter module, downstream of the Individual module. Expert know-how and unique Hel -X biomedia provides for reliable nutrient reduction in the filter. Accepts flow rates of up to 50000 litres per hour. 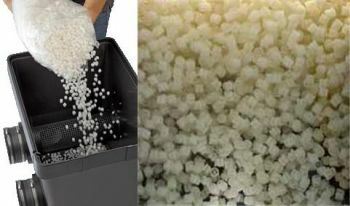 50 litres of Hel-X bio media (supplied) has large settlement surface area for micro-organisms. Innovative by-pass technology for optimal movement of Hel-X biomedia, even at high flow rates. Efficient removal of toxins such as ammonium / ammonia and nitrite. The AP4800 Air Pump Kit is recommended for oxygenation of the Hel-X Biomedia (available separately). Selection charts for Proficlear modules, UVC & Pump combinations on Performance tab below. Proficlear Premium Moving Bed Module with Hel-X - a microbiological water treatment that achieves extremely effective decomposition of nutrients and pollutants in constantly moving bed process. 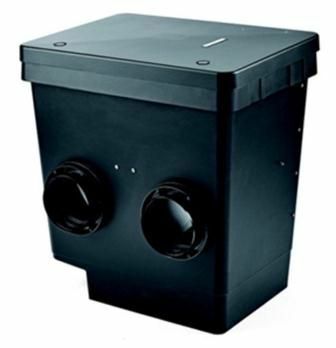 Once established with beneficial micro-organisms, the 50 litres of the supplied Hel-X biomedia will decompose approximately 300g of fish waste/food a day. The module will accept a maximum of 100 litres of Hel-X which would double this capacity (extra Hel-X bio media Booster Packs available seperately). Up to 3 Moving Bed Modules can be connected, in series, for maximum biological filtration. A permanent optimum oxygen supply supports self cleaning effect of dead biomass. The new generation of Proficlear Premium Modular pond filters are capable of processing large bodies of water, swim ponds, ornamental, fish ponds and Koi Ponds of up to 200,000 Litres. Having spent over 3 years in development, Oase have released a truly ground-breaking pond filtration system specifically developed, jointly in intensive co-operation with leading European koi experts, for ornamental Koi ponds. The Proficlear Premium filters are modular in design so can be tailored to suit virtually any pond size and type. The major innovation lies with the Drum Filter Module. The sophisticated self-cleaning drum filter will automatically separate and remove coarse debris down to 60 microns, yet handle up to 25,000 litres/hour (5,555 Gals/hr) flow through. 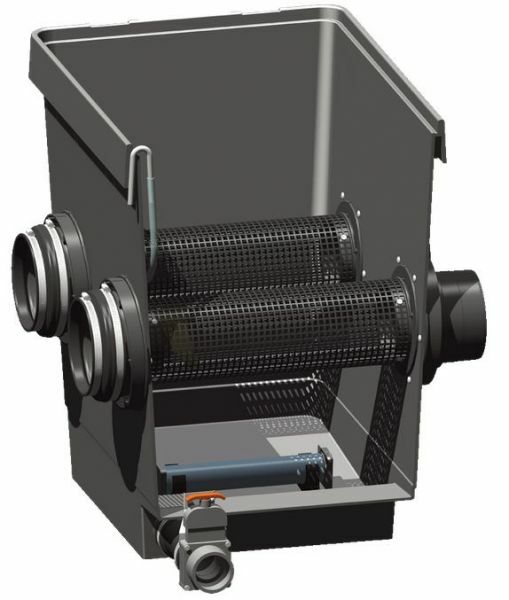 The intelligent, automated self cleaning mechanism uses high pressure water jets to periodically cleanse the stainless steel filter sieves, minimising the need to service the filter module. The second stage filtration utilises the Oase Proficlear Premium Moving Bed Module. Each module contains OASE Hel-X bio media, with each element featuring an extremely large biological settlement surface area. The Hel-X media effectively removes toxins such as ammonium, ammonia and nitrite. The option to connect an air pump to the supplied aerator bar will allow the entire Hel-X bio media to be circulated with optimum oxygen enrichment. Multiple Moving Bed Modules can be used to increase the specialist Koi filter capability. The Hel-X biological media in Moving Bed module can also be increased, up to 100 Litres (50 Litres supplied). The final stage of the filtration process uses the Oase Individual Module. This versatile module can be incorporated to house additional media such as Zeolite and Phosless (phosphate binder), should the water conditions require. The Individual Module can also be used to house Aquamax Gravity ECO pumps and the new Bitron Gravity 55 watt UV Clarifiers. The Hel-X Moving Bed Module ensures optimum biological media circulation. The unique structure of the Hel - X biomedia provides an unbeatably large, protected surface for settlement of beneficial micro-organisms. 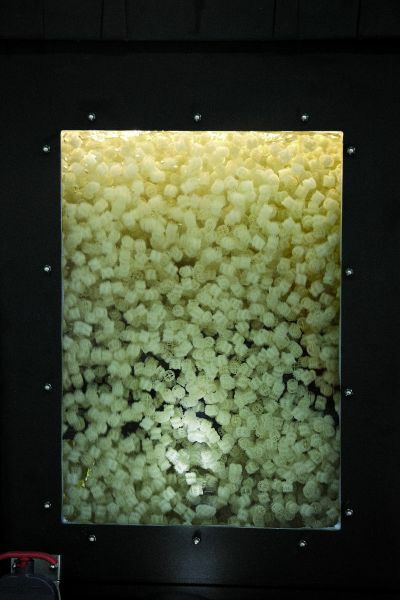 The moving bed process and innovative bypass technology ensure optimal movement of the biomedia, even at high flow rates, as well as self-cleaning of dead biomass. The pre-installed, integrated aerator bar, can be connected to the AP4800 Air Pump (not supplied) which enriches the module with additional beneficial oxygen, to further enhance the biological process. The original design of the Hel-X biomedia provides a protected internal surface area, for population of beneficial micro-organisms, 25% higher than Kaldness K1, achieving a highly efficient biological filtration process. 50 litres of Hel-X media is supplied as standard with the Moving Bed Module with scope to add up to an additional 50 litres of Hel-X media to increase biological filtration performance. The powerful AP4800 Air Pump (not supplied) should be used to provide optimal oxygenation within the Moving Bed Module. Proficlear Pump Fed Discharge Kit. The Discharge Kit is used when the Moving Bed and Individual Modules are not used, ensuring the correct water level inside the module is achieved. Converts 2 x DN150 outlets to 2 x 100mm I.D. push fit outlets. 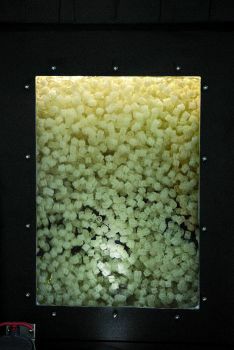 OASE Moving Bed Modules include 50 litres of Hel-X bio-elements which is sufficient to process 0.3 kg of fish food per day. Each Moving Bed Module will accept an additional 50 litres of Hel-X biomedia if required. The tables below give Oase's recommended filter system components for Koi Ponds, Average Fish (e.g. goldfish) Ponds and for Natural or Formal Ponds without fish stock. Pump and UVC options below are to suit either Gravity Fed OR Pump Fed installations. Should your pond be larger than the maximum covered below, or should there be other special requirements, please telephone us on 02392 373735 and we will do our best to help. Pump Fed System pump selections allow 1 metre vertical lift above pond water level and 15 metres x 38mm (Aquamax Premium) or 50mm (Aquamax Twin) internal diameter hose from pump to filter. Please note: in cases of extreme temperature variations due to shallow pond (less than 75cm) or location in continuous direct sunlight (south facing); higher friction losses due to longer hose lengths; or higher delivery heads we recommend discussing your requirements with our technical support team.